One of the world's largest paint manufacturers continues to add a toxic heavy metal to products it sells outside the U.S., mostly in poor countries, despite decades of health warnings and ongoing pleas to stop the practice -- the latest of which came from the company's own investors. A recent government decision allowed PPG Industries to ignore a shareholder proposal to remove lead from its industrial paints, in a move health advocates call potentially "precedent-setting." Nine organizations that own shares in PPG Industries, the world's second-largest paint maker, filed a shareholder proposal with the U.S. Securities and Exchange Commission in late 2014 asking PPG to come up with a plan for the eventual phase-out of lead from all its paints. 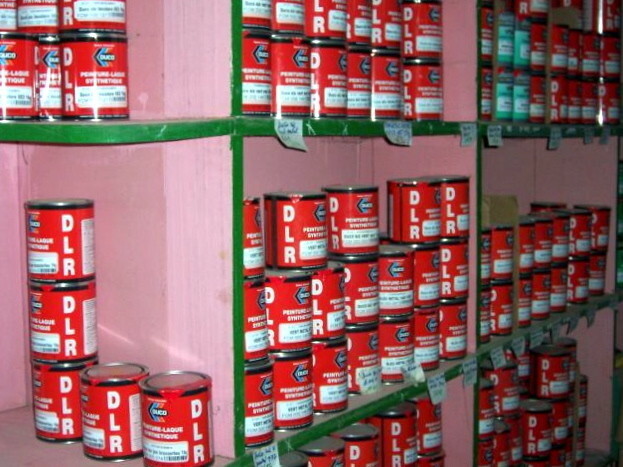 Industrial paints are the major holdout for the company, which has otherwise largely removed lead from its products. Industrial uses include bridges, building components, pavement markings and cars. In the proposal, investors highlighted the neurotoxic, developmental and cardiovascular risks to children and adults from exposure to lead paint, not to mention economic effects like an estimated $977 billion in lost productivity. On February 26, the SEC said that PPG could disregard the proposal and legally avoid voting on the matter at their annual shareholder meeting, which took place in April. "Companies don't like these votes," Perry Gottesfeld, executive director of the nonprofit Occupational Knowledge International, told The Huffington Post. (The nonprofit has advocated with PPG's shareholders on the issue.) A majority vote by shareholders, while technically only advisory, will often pressure a company to pass a resolution, Gottesfeld explained. The SEC ruling "has serious implications for any future actions shareholders may want to take in regards to similar issues," he added. The ruling appears to be a policy change from prior SEC decisions touching on environmental issues. The SEC declined to comment on why it issued the so-called no action ruling, but in its decision the agency said there was "some basis" for exclusion of the shareholder proposal under a federal rule relating to "ordinary business operations." In other words, the agency agreed with PPG that the decision on using lead paint is related to the kinds of products the company sells and is, therefore, best reserved for the company's management. But industry critics argue that lead is one part of a product's content, not the product itself -- and it's far from an irreplaceable ingredient. "Alternatives for lead additives in paint have been known for over 150 years," Gottesfeld said. PPG itself developed a metal primer for use as a lead substitute in automobile paint, for which the company received the Environmental Protection Agency's Greener Chemicals Award in 2001. The EPA called the replacement "100 times safer than lead at typical levels of use." "Given pigments and driers that do not contain lead are now widely available, there is no need or justification to intentionally add lead compounds to paint," Diana Abrahams, a spokeswoman with AkzoNobel, told HuffPost in an email. Her company, the world's largest paint manufacturer, completely phased lead out of their products worldwide in 2011. To be fair, PPG recently agreed to use lead-free alternatives in architectural or decorative paints made for sale anywhere in the world, after selling leaded house paint in Africa as recently as 2013. But the shareholders' proposal focused on the lingering inclusion of lead in industrial paints. Those paints "generally have lead concentrations that are up to ten times greater" than house paints, Gottesfeld wrote in a recent article. And the lack of regulation in many countries means it's difficult to be sure industrial paints aren't actually used in homes, schools or hospitals. Furniture, toys and other consumer products can also be coated with these industrial paints due to weakly enforced or absent regulations. Products containing lead can find their way on to U.S. store shelves as well. Lead-containing paints make up less than 1 percent PPG's products sold, according to Mark Silvey, a company spokesman. But Gottesfeld and Lewis said this figure could be misleading depending on how it's measured. The company's sales include many non-paint products, like synthetic papers and precipitated silicas for tires and battery separators. At greatest risk for health hazards are the workers involved in making, applying or removing paint, who can also carry the toxin home on their clothing. Industrial lead paint can also pose a danger for people living near factories, car repair shops or bridges -- places where the paint is made, applied or removed. In the early 1980s, the sandblasting, scraping and repainting of the Mystic River Bridge in Boston, Massachusetts, left "street after street heavily contaminated," noted Bruce Lanphear, a professor of environmental health expert at Simon Fraser University in British Columbia. "There will be more of these kinds of environmental disasters, as well as ongoing contamination of the environment with lead -- which is very difficult and costly to get rid of," he said. "With very little consideration for human health or the environment, this company is basically externalizing all these costs on to the public and on to countries that don't have regulations to protect them." While scientists have warned of lead paint's hazards for more than a century, new evidence of its potential impact continues to emerge. Over the last few years, the number of health issues linked to lead exposure has risen, while the amount of exposure found to trigger those problems has dropped. "Even at very low levels, we see evidence of lead's damage to children's brains. Not only is there no apparent threshold for the affects of lead on IQ or learning, the lowest levels of exposure result in the greatest relative detriments," he added. "And it's not just children." Research suggests that adults exposed to low levels of lead may be at increased risk of chronic kidney disease, hypertension and death from heart disease. There are even hints of potential links to Alzheimer's and ALS. The U.S. itself has not formally restricted lead content in industrial paints. However, regulations for public works projects -- which followed a 1978 ban on leaded house paint -- have generally eliminated the addition of the heavy metal to paints used domestically. The same is not true in much of the developing world, where any rules concerning lead paint remain rare. Silvey, the PPG spokesman, told HuffPost in an email that PPG paints "comply with all applicable legal standards in the markets where the paints are sold." He added that the company "looks forward to continuing its dialogue with shareholder proponents on this topic." But the shareholders are frustrated with the SEC's apparent policy tilt in February, which contradicts the agency's previous actions, said Sanford Lewis, the attorney representing the nine shareholders. The SEC recognized in 1998 that matters "focusing on sufficiently significant social policy issues . . . generally would not be considered excludable." This policy seemed to hold through previous proposals from Dow Chemical, Union Camp and Baxter International shareholders related to environmental health threats from those companies, Lewis said. In each proposal, the SEC found that environmental impacts were not excludable, and each resulted in the phase-out of certain product materials. The February decision made no reference to the SEC's 1998 policy. "It would be kind of hard for them to actually state that lead paint and public health is not a significant public policy issue," Lewis said. Cathy Rowan, director of socially responsible investments for Trinity Health, one of the shareholders behind the proposal, called the SEC's decision "disappointing" and "very concerning." The group of nine plans to strategize this summer on how best to reengage PPG, she added. "Trinity is seeing impacts of lead paint poisoning in many communities which it serves," Rowan said. "Be it lead, be it BPA, be it brominated flame retardants, these environmental concerns are also business risks to companies." In a 2013 trial, three paint makers were ordered to pay more than $1 billion for the removal of lead paint from older homes in parts of California. The judge found that the companies had marketed the paint while knowing it was harmful to children. "Companies at least have to recognize they could still be held liable," said Lanphear, the environmental professor. "They should be concerned about that, if not the public health implications of selling a poisonous product."